Looking for amazing taste and true flavor innovation? These artisan hand painted chocolates will captivate even the most discriminating chocophiles. Renowned chocolatier Fritz Knipschildt combines exquisite old European craftsmanship, intriguing avant-garde flavor combinations and state-of the art handpicked natural ingredients to create artistic customized chocolates. Each exquisite piece is carefully hand painted and packed into unique sustainable boxes. Fritz Knipschildt blends the influence of his Scandinavian roots with handpicked natural ingredients local to New England. The result is a truly premium chocolate collection that delivers a luxurious, sophisticated haute couture style experience. Each handcrafted chocolate is an artistic handmade jewel. 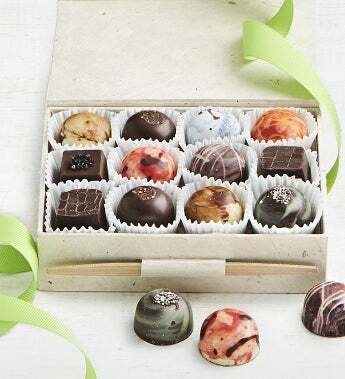 These preeminent quality chocolates come packed in handcrafted, all natural and sustainable paperboard boxes from Nepal and are artfully sealed with a bamboo stick. Ana Carlota® Madagascar pickled green peppercorn white chocolate ganache in 71% Ecuadorian single bean dark chocolate, topped with Cyprus black lava salt.